Taj mahal was built by Shah Jahan for his beloved queen Mumtaz Mahal as a labor of love. It is graced by four minarets and a perfect dome, beneath which rests their tombs. It's not just the perfect symmetry in its design, but the exquisite carving covering every inch of the marble that grabs your attention. These intricately carved designs, mostly floral bouquets, are inlaid with precious stones. A peculiar feature - watch the calligraphy adorning the walls. They increase in size as you look up, creating an optical illusion of all letters being the same size. Another astounding feature is the filigree screens that surround the cenotaph carved out of a single piece of marble. 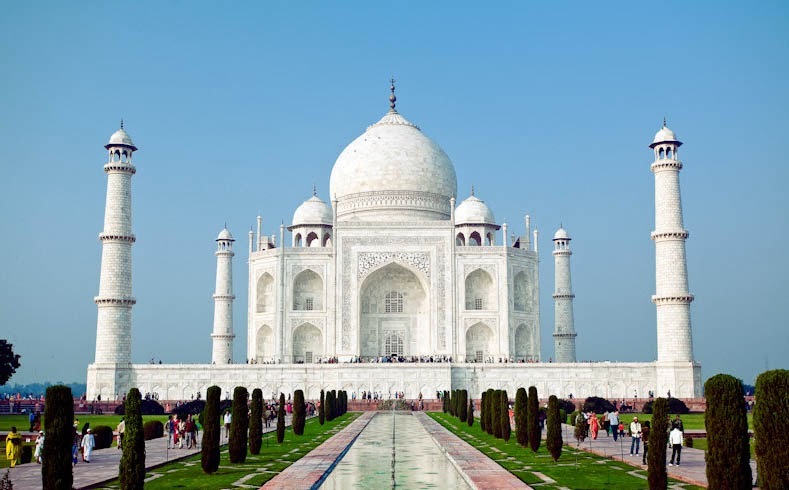 It is believed that the Taj changes color depending on what time of the day it is. We recommend visiting it in the wee hours of the morning or in the evening when the sunset renders it an orange hue. The best time, though is on a full moon night when the entire structure is bathed in a silvery sheen, giving it an ethereal appearance.